Coffee is rich in bioactive compounds with health beneficial properties, with green coffee presenting higher phenol content than roasted. We evaluated the effects of regularly consuming realistic amounts of a green/roasted coffee blend on cardiovascular health-related biomarkers. A randomized, cross-over, controlled study was carried out in 25 normocholesterolemic [total cholesterol (TC) < 200 mg/dL] and 27 hypercholesterolemic (TC 200–240 mg/dL) subjects. During 8 weeks, volunteers consumed 6 g/day of soluble green/roasted (35:65) coffee or a control beverage (water or an isotonic drink). Blood pressure, heart rate and body weight were monitored at the end of each intervention, and serum lipids [TC, HDL-C, LDL-C, VLDL-C, triglycerides and phospholipids], cytokines and chemokines (IL-1β, IL-2, IL-4, IL-5, IL-6, IL-7, IL-10, IL-12, IL-13, IL-17, G-CSF, GM-CSF, MCP-1, MIP-1β, TNF-α, INF-γ), adhesion molecules (ICAM-1, VCAM-1), and C-reactive protein were measured. Plasma antioxidant capacity (FRAP, ORAC and ABTS methods), and lipid (malondialdehyde, MDA) and protein (carbonyl groups, CG) oxidation were also determined. Attending to the general lineal model of variance for repeated measures, after the green/roasted coffee intervention significant reductions in TC, LDL-C, VLDL-C and triglycerides levels (p = 0.006, 0.001, 0.003 and 0.017, respectively), and a significant group effect were observed (0.001, < 0.001, 0.019 and 0.027, respectively). Only within the hypercholesterolemic group, attending to the Bonferroni test, the aforementioned lipid parameters were significantly lower after regular green/roasted coffee intake compared to baseline values. Moreover, after the coffee stage, plasma antioxidant capacity improved, according to the increase in ORAC and FRAP values (p < 0.001 and p < 0.001, respectively) and decrease of MDA (p = 0.015) and CG (p < 0.001) levels, without differences between groups. Systolic (p = 0.001) and diastolic (p < 0.001) blood pressure, heart rate (p = 0.035), and body weight (p = 0.017) were reduced in both normo- and hypercholesterolemic groups. 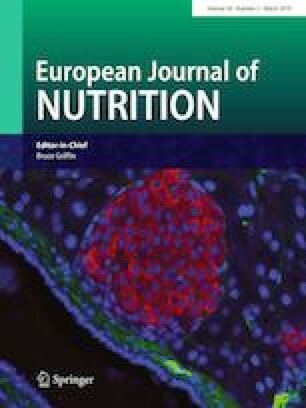 Regular consumption of moderate amounts of a soluble green/roasted (35:65) coffee blend may contribute to improve cardiovascular health in moderately hypercholesterolemic people, as reducing serum lipids, blood pressure and body weight effects, as well as increasing plasma antioxidant capacity, have been observed. Moreover, positive influences on blood pressure, body weight, and plasma antioxidant capacity were obtained in the healthy group. Therefore, incorporation of green coffee beans into the coffee brew can be recommended as part of a dietary strategy to protect from cardiovascular disease. Sara Martínez-López and Beatriz Sarriá have equally contributed to this work. The financial support of projects AGL2010-18269 and AGL2015-69986-R from the Spanish Ministry of Economy, Industry and Competitivity is acknowledged. We want to thank the volunteers who participated in the study, J. L. Sierra Cinos and L. García-Diz for their assistance in anthropometric measurements, M. Jimenez and L. T. Cayuelas for their assistance in dietary records analysis and M. Barba and C. Oeo for their assistance in lab analysis. Nestle, S. A. provided and packed the soluble coffee product for free. S. M.-L. thanks the Spanish National Research Council for her pre-doctoral fellowship under the JAE-Pre programme co-funded by CSIC and the European Social Fund. L.B. designed the trial and has the primary responsibility for final content. B.S. and S.M.-L carried out the statistical analysis of data. B.S., R.M. and S.M.-L. conducted the research and interpreted the results. S.M.-L wrote the initial draft and all authors revised and approved the final version of the manuscript. This study was funded by Projects AGL2010-18269 and AGL2015-69986-R from the Spanish Ministry of Economy and Competitivity and approved by Ethical Committee Hospital Puerta de Hierro (Majadahonda, Madrid).